First of all, please keep in mind that NeonLaws.com does not encourage or recommend breaking the law in any way. If underglow is illegal in your state then we highly recommend you accept it and consider other legal car modifications. That being said, we understand dedicated car enthusiasts often like to bend the rules and install neon underglow regardless if it’s legal or not in their state of residence. It’s up to each individual to weigh in the the risk of getting caught and paying fines and determine for themselves whether it’s worth taking or not. 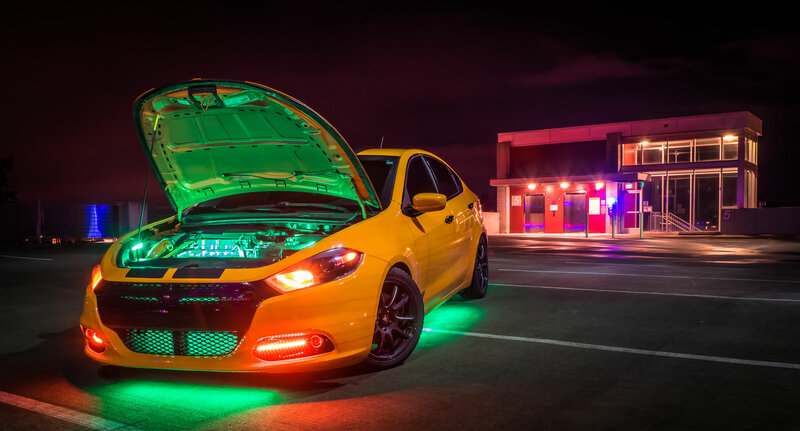 Most US states neither prohibit nor specifically allow the use of neon underglow on cars, which is why thousands of owners choose to install it. Installing car underglow in states where it’s not illegal just means you need to read the laws and regulations carefully, and avoid using any restricted vehicle lighting. Especially important restrictions include those for specific colors or flashing lights. Breaking the law and using prohibited vehicle lighting modifications is strongly not advisable, so make sure you fully understand and be prepared to face the consequences, which vary in each of the 50 states. Laws may also be different in your city or county so we always recommend double-checking our information with your local authorities. Punishments for violation of vehicle equipment regulations range from trivial fines to more serious offenses. In Ohio, where underglow is legally permitted, violation of laws can result in a fine of up to $2,000 and even include jail time in addition, so make sure you are aware of the consequences before you decide to break the law. If you’re still adamant about installing neon underglow on your car we have a few tips about common underglow mistakes which will help you avoid serious fines, especially if pulled over by more forgiving and understanding law enforcement officers! This is the most important thing for any aftermarket lighting installed on vehicles. Usage of flashing lights is forbidden in nearly all states, as these are reserved for “official” non-civilian vehicles: fire department, police officers, ambulance, and other emergency or special services. Obviously turn signals are the exception, but do not try to take advantage of this. Flashing neon underglow is in almost all cases illegal and will sooner or later cause you a lot of trouble with law enforcement, so avoid it at all costs. Furthermore it truly is very distracting to other drivers. If you believe it’s not distracting see our Why is underglow illegal article and we’ll change your mind. Flashing light restrictions often also include all kinds of rotating, oscillating, color-changing, moving, fading, or otherwise non-stationary (steady) emitting glow. All states have different regulations, but the three most commonly prohibited colors for vehicle lamps are blue, red and green. Blue and red lights (flashing or not) are generally banned across all states as they are reserved for emergency vehicles. The last thing you want is some over-eager police officer fining you for impersonating law enforcement, and if you catch the officer on a bad day this may be exactly what happens. Depending on which state you live in this can be considered a serious offense and it’s a restriction we strongly advise you to keep in mind. An example we can use here is Ohio, where car undercarriage lighting is legal and all colors are permitted as long as the lights aren’t flashing. This state is an exception however. In Montana blue, red and green colored lamps are all illegal. In Louisiana and Oklahoma you may not use blue colored lights on any part of the vehicle, while in Kansas you may use all colors except red. Some states only permit specific colors for underglow. An example is New York which only permits using white underglow. Point being, there is no uniform law and each state has different color restrictions which we all specified on our individual state neon underglow laws pages, so ensure you read our summary of the state your vehicle is registered in and familiarize yourself with all restrictions and regulations. There are even some states which prohibit the possession and installation of certain restricted colors, which can technically be problematic in case of LED underglow. LED lights can often emit millions of different colors and shades. Even if you drive with legally permitted colors, in case you’re stopped by law enforcement officers do not tell them you can change colors. Assuming underglow is legal in your state, you should always ensure the light sources aren’t directly exposed. The halo glow effect under your car is achieved regardless of whether others can see neon tubes or LED diodes, so stay on the safe side and hide bulbs underneath your car. Those who do additional research on the topic may often come across a common misconception that underglow illumination is legal in all states if the bulbs or other light sources aren’t directly visible. That’s simply not true, and we advise you to listen to facts and not opinions. If you wish to break the law and install illegal underbody glow make sure you understand that it makes no difference whether the lights are directly visible or not. It only matters in states which do specifically allow after-market vehicle light modifications. Always do your best to install underglow in such a way that light emission does not fall outside vehicle dimensions. In some cases where this isn’t the case it can cause confusion about vehicle dimensions, upon which you may get a citation for operating an unsafe vehicle and/or endangering other drivers. It’s equally important to keep the lights under your vehicle’s chassis, and ensure the light isn’t directly visible from sides. You can see a practical example on the image we attached in the beginning of this article: green lights are visible from the front of a vehicle, which is illegal in multiple states. In most states, only white lights would be permitted on the front of the vehicle, and red in the back. Keep your neons under the vehicle and ensure the lights do not illuminate the ground ahead, behind, nor the sides. Basically don’t forget the point of underglow, which is to illuminate the ground under your car. Illumination on fenders, tires of other parts of a vehicle is usually illegal. Our legal/illegal classifications are based on the fact you are only illuminating the ground beneath your vehicle, and not it’s parts. If banned in your state turning on neon underglow even while parked can get you into trouble, so imagine how much more serious it can get if you use it while driving. Underglow is fun when used to showcase the car to your friends in private backyards, but driving around with an illuminated car can and will cause (sometimes unwanted) attention. In some states like Massachusetts or Pennsylvania all aftermarket lights are considered an unlawful vehicle modification. Despite the low chance of anyone noticing your underbody lights if they are turned off while driving, in these states even installing underbody lighting is against the law. If you keep the underglow turned off while on public roads chances are you’ll drive for years without any trouble, but it’s a risk you must assume yourself. In fact if you’re ever in doubt as to whether underglow is legal or not, simply turn it off while driving. It’s a vanity item, and almost never worth the legal fees attached. Neon glow is illegal in Washington and Michigan for example, but in these states the law expressly permits using it while not on public roads. It may seem harmless, but it’s far from it. This doesn’t have anything to do with underglow, but we know many enthusiasts install aftermarket lights near their registration plates. Nearly every state requires license plate illumination to be white, and clearly legible from 25 feet or more. Installing additional neon or led lights near your registration plate can make it more difficult to read and we recommend avoiding it. Seriously, don’t! Residents of Illinois, Maine, Washington, Michigan: we feel for you. Hopefully your state legislation will change in the future, but until then we do not recommend using any prohibited non-factory vehicle lights including neon glow. There’s really no getting away with underglow in these state where it’s illegal to use while driving, and you will get pulled over by police or state patrol. In the end you’ll likely have to pay a fine, remove the underglow, and walk away frustrated and disappointed with unnecessary legal bills. Don’t expect every police officer to remember all the details about laws. Some officers may hassle you about underglow even if it’s perfectly legal, so having a copy of the pertinent laws at hand to show them in case you’re stopped can prove useful. Our website is for informational purposes only and should not be considered or used as professional legal advice, but we are still the first and most relevant and up to date resource on U.S. underglow laws. Please keep in mind our articles are copyrighted and we do not permit republishing or redistributing them without our explicit permission, but you hereby have our blessing to print a page with your state laws for personal use. Hopefully it will never be necessary, but shove it in your glove compartment; you may thank us one day. Final tip: check your local laws! Different municipalities, cities or counties may have exceptions to state laws, or additional restrictions. We always advise you to contact your local police department or DMV office and get first-hand information on whether underglow is legal or illegal. If possible get it in writing. Asking a friend who has a cousin who knows a police officer is usually a good way to get inaccurate or incomplete information. Hopefully these few tips will help you avoid any unwanted attention and ensure you can use neon car underglow without any problems. Underglow can truly make a car stand out and it’s understandably a popular modification, but make sure to follow our tips to avoid trouble. If you know of any other common underglow mistakes that drivers make feel free to get in touch with us and we’ll happily add additional information!